I've made a bit of a decision not to download too many more LGBT movies until I've made more of a dent in terms of actually watching them. And despite my best efforts, there are still a lot of them in my queue, many of them being harder to watch due to language restrictions. Dorian Blues is one of those movies that has just been sitting around with me not really knowing whether I wanted to watch it or not. But given a slow enough afternoon and the fact that the DVD was easily accessible, I finally got over this particular hump. I only knew that the story had both comedic and dramatic elements, although one could argue that those characteristics probably describe a vast majority of LGBT movies out there. We're never too happy nor are we ever overly serious at the same time. Or something like that. The movie was a little better than I expected given the year it came out - a lot of earlier LGBT movies had a very strong indie vibe that included the use of shaky home video cameras and really bad sound. This was more polished, but the story certainly could have been better. 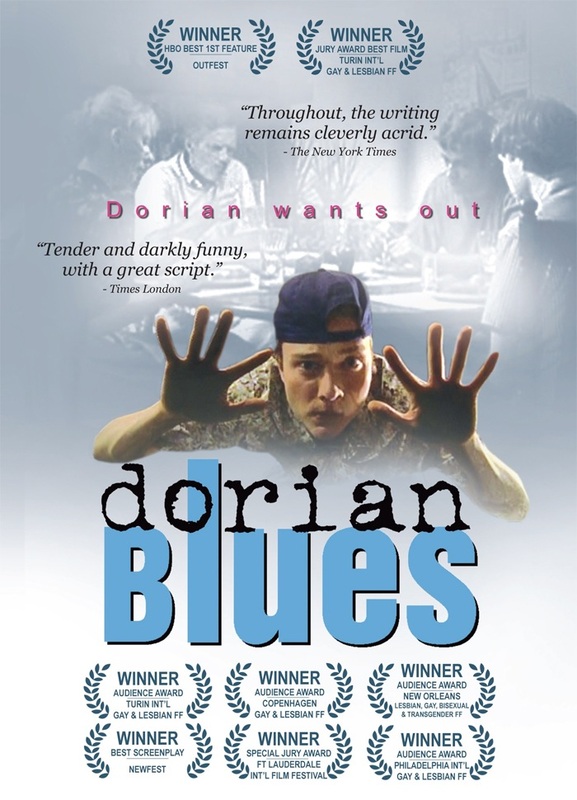 Synopsis: Dorian Blues is a 2004 LGBT comedy drama movie written and directed by Tennyson Bardwell. The story was loosely based on Bardwell's college roommate. Dorian (Michael McMillian) is a high school senior and is dealing with the realization that he's gay. He tries to find other gay teens to talk to in order to help him come to terms with things but eventually he decides to take the leap of faith and come out to his brother, Nicky (Lea Coco). Nicky takes things fairly well (or at least things could have been much worse, but they both know that the bigger challenge with be their father, Tom (Steven Charles Fletcher), who tends to have very strong opinions on matters and is rather tied to more "traditional" male stereotypes. Dorian then resorts to various strategies in an attempt to deal with this aspect of his life including going to therapy and trying to seek counsel from a priest. But in the end it falls back to Nicky to be his main support, whether Nicky is fully prepared for this or not. But Dorian continues to struggle with whether or not this is something he's ready for, going as far as thinking that it would better if he somehow "became straight" in order to lead a less complicated life. And how his little life dramas unfold is really what makes up this movie. You can sense how the story was inspired to some extent by a real person given how fleshed out things are in terms of the characters. There are a lot of rich interconnections between the various characters that keep the story fairly tight and nicely compelling. Too many times we encounter far too many characters thrown into the narrative blender and the result is a lot of weak character development that ultimately hurts the story as well. The core conflict here is a common one among gay men, especially when their families do not appear to be 100% supportive of who they are. And as complex as such cases may be in reality, I think the movie managed to capture things decently well in a way that conveyed a lot of the hardships in a light and still entertaining manner without overwhelming the viewer with too much mental and emotional baggage. And not, the conflict was not just about Dorian and his father, but ultimately Dorian and his ability to accept the truth of who he is and what this may mean to other people. The brother angle was a nice one - a good transition between trying to fit in with the views of your peer group in terms of gender stereotypes but at the same time recognizing the importance of family. Nicky had his own share of dealing with this odd dichotomy to their shared lives and it was conveyed well enough in terms of both the writing and the actual acting performance. The movie ends on a bit of an abrupt note, but given how much had been invested in prior story development, I can understand how that was ultimately a safe enough place to end the story. I can't say that this is my favorite LGBT movie of all time - it certainly had its share of issues in terms of overall direction for scenes or even balancing the humor with the drama. At its core, Dorian Blues has a good story to tell - a story whose value comes from how real it feels and how close to home it can be for many gay men out there. The comedic bits are there to try and lighten the mood a bit, but there are still some compelling questions raised in this story. Thus the movie gets a good 3.5 things that Dorian tries in order to fit in more out of a possible 5.